I believe that we should never stop learning. I learn every day. I learn about life and art, of course, and I love to learn about polymer clay. I experiment, figure stuff out, and seek out what’s new in the community. I am passionate about this and I want to share it with you. You’ve read my long-form reviews, articles and experiments on The Blue Bottle Tree. But until now there hasn’t been a good place to share with you all the little snippets and tidbits of inspiration, ideas, and tips that will help make your creative time more enjoyable. Now there is. Join me in The Muse, a premium email sent each Monday, Wednesday, and Friday. Each day’s musing will contain a single topic, easily read. You’ll learn about many subjects over time, however, and you’ll get my best advice, creative inspiration, and trusted insider info. Learn to grow your skills so you’ll spend more time making things you love (and less time wondering why something didn’t work). The cost to join The Muse is just $5 per month. I will work to keep the cost low while still covering my expenses. I’ve got so much to share with you in these musings. I can’t wait for you to join me! Each Monday, Wednesday, and Friday you’ll receive a focused, single-topic email from Ginger of The Blue Bottle Tree. The topics covered will be tips, tricks, inspiration, community news, creative support, musings, and more. Ginger started this email subscription to bring you the bits of info that aren’t quite enough for a full article, but too interesting to be missed. Join this premium subscription and enhance both your journey and your joy in creating. This upgraded, premium subscription is not the same as my free monthly newsletter. I’ll still be sharing that with you, in addition to the thrice weekly musings of The Muse. See a sample email here. Ginger’s “Muse” newsletter is a must-read for all polymer artists and aspiring polymer artists. They’re easily-digestible pages of tips (typically one idea per post) that provide new information, provide resources, remind you of old information you forgot, or give you new ways of doing/looking at things. They’re well-written (obviously; everything she writes is! ), concise, and don’t require a lot of prerequisite knowledge. In spite of feeling as if I know pretty much everything about working with polymer at this point, I still find ideas, inspiration, reminders, how-tos, and other useful topics in every newsletter. She’s not called “Gingerpedia” for nothing! You, too, can feel smarter with every email delivery if you subscribe now (for less than a cup of snobby coffee). One of the few “newsletters” in my inbox that I actually look forward to. Ginger always has great tips and tricks, and inspiration. Totally worth the price. 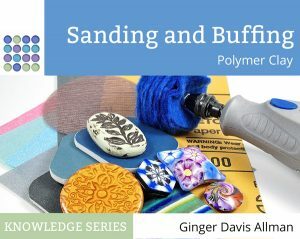 I think I’m pretty knowledgeable about polymer-related topics but Ginger teaches me something every week. We in the polymer community are so fortunate to have her as a resource. There is a lot of bad and wrong information floating out there. This newsletter is a great format of quick and useful tips that you know is based on science and not myth! I highly recommend it! I really enjoy Ginger’s emails. They are very well written and short enough to not bore you and at the same time are chalked full of great tips tricks, new perspectives and inspirations. I truly love receiving it.